I began my experience in flight on October 4th of 2017 with an FT Explorer (that flew rather poorly). Since then, I can't seem to stop building! I have greatly enjoyed the flexibility, affordability, and flight envelope of DTFB, and I find electric motors to be wonderful (I'm a Computer Engineer, so I nerd out when it comes to electronics). 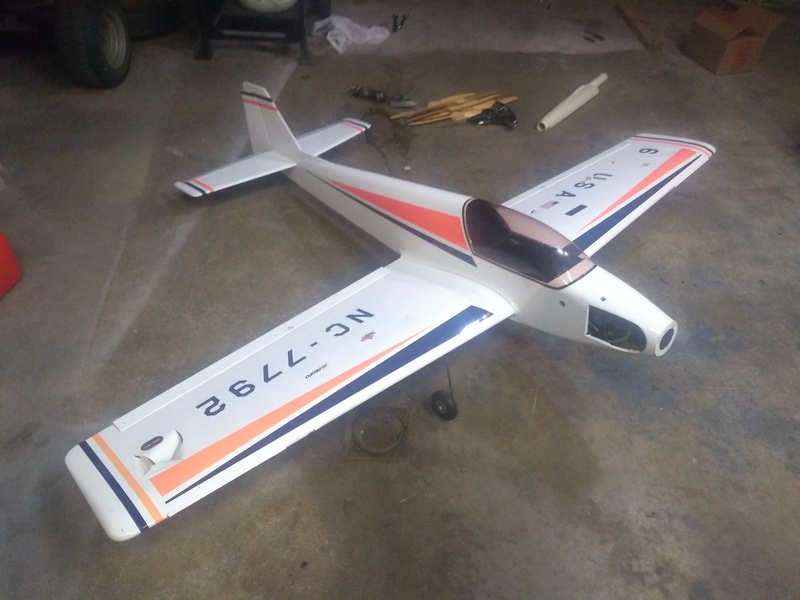 I've even gotten into 3d printed aircraft with 3dLabPrint and I've found them to release some fairly amazing designs that are easy to build and fly like a dream. Still, I've always been a bit of a gearhead, and I've wanted to get something fuel-powered to see what it's like. The issue is, fuel airplanes can be expense. Brand new gas or glow engines can cost $200 and up, then you need to pay for fuel and find an airframe that can support them. I knew I'd have to save up for awhile in order to afford something like that. That takes us to September of 2018, when I found an ad for an estate sale for a guy who was very much into the hobby. There were over 200 airframes for sale, from 60" glow models to 120" gas models. It was a 3 hour drive for me to get there, but I talked with the guy selling the models and he had 30 years in the hobby and said he could get me a deal. Get me a deal he did! In short, I came home with 3 complete airplanes for $400. He even let me pick out some stuff from the estate to help me get started such as a covering iron and starter, and he didn't charge me more for it. What a great guy! Anyhow, that should sum up my history a bit. The reason I wanted to write this thread was because I think there's a lack of fuel talk on this forum. I fully understand that this is a primarily electric forum, and my perception is that this is due to the versatility, affordability, and fun of DTFB aircraft. I totally get that! 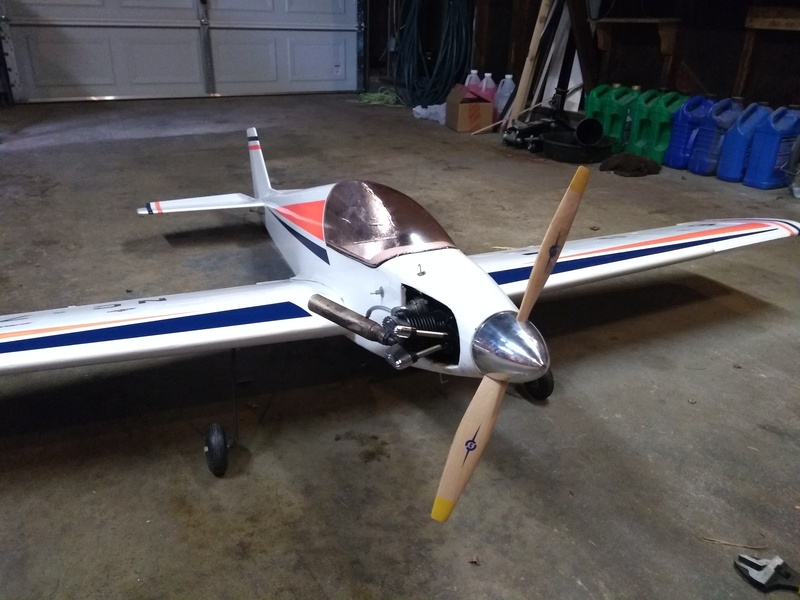 But this hobby has a wonderfully high ceiling and while I don't want to reach the point where I'm dumping thousands of dollars into my airplanes, I want to see what this fuel thing is about and I'd like to make it easier for others to do the same. Hopefully this thread and others like it can provide some inspiration for anyone who wants to move up to bigger airplanes, provided they have the storage space and access to a field! Soon after buying the fuel airplanes I got in touch with my local flying field and joined the club. I'd been throwing the idea around for awhile and figured I'd have to at this point, as I can't fly an 80" airplane out of my backyard. I'm so glad I did, as I'm getting to meet some really great guys (most are pretty old, but that's a lot of wisdom). They have been helping me immensely to get things in flying condition. This brings me to now, with my Ultra Sport 1000. It's a "Classic Pattern" style airplane, and it had a sticker on it from 1992 so it's at least that old. 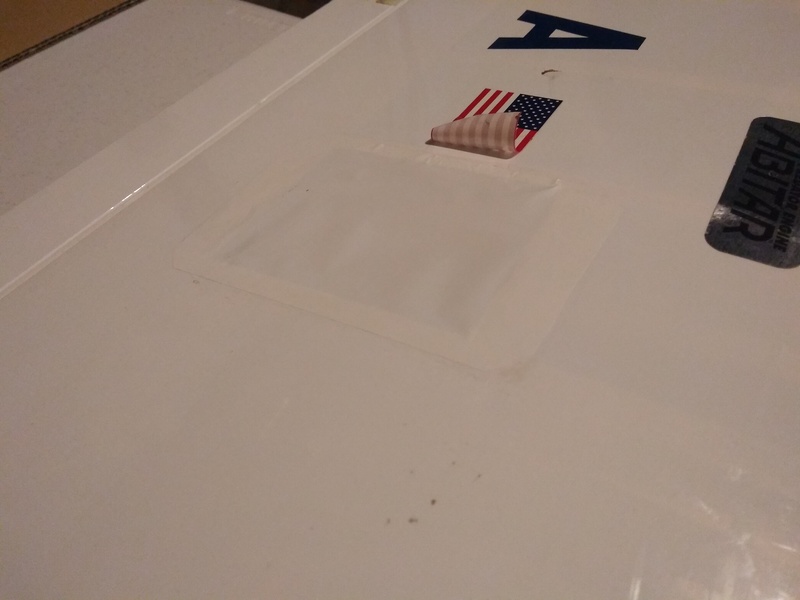 Being excited and impatient, I decided to go the easy route on many of the defects and just use tape to re-seal the holes. It doesn't look perfect but it'll still fly just fine, and I'm often a performance-over-beauty kind of guy. I do have aspirations to make the covering look better in the future, but probably not until it's too cold to fly. Once that was done, I moved on to the engine. Remember how I said it was removed? Well, when I bought the airplane the crankshaft didn't turn. It's not that it had good compression (when you turn a gas engine by hand, it'll have a stroke where it compresses the air in the cylinder, making it hard to turn), it simply was stuck. The seller told me it likely just needed to be baked in the oven because the lubrication had gummed up. I was skeptical, knowing nothing about glow engines, but I trusted him. So, when I got home, I popped the engine out and stuck it in the oven at 250. It's a 4-stroke Saito 150 (1.5 cubic inches). It swings a 16x8 propeller and makes around 2.5 horsepower, or roughly equivalent to a 2000 watt electric motor. It's missing the rocker covers (they go on the top of the engine and protect the rockers that operate the valves) and the High Speed Needle (this controls the amount of fuel that goes into the engine while it's running). Once I baked the engine I found that it turned over easily by hand, and I could feel the compression stroke. What a relief! So I ordered the parts I needed on Horizon Hobby and once they arrived installed them. While the rocker covers were off I set the gap between the rockers and the pushrods according to the engine manual. I was ready to start the engine! after a good bit of fiddling with the needle and throttle it started right up. All I had for a prop was a 17x6, which was a little too big for the engine, but I figured it would run alright. And it does run well! I was very happy to see it start and run for the first time. I ordered new glow plugs for it (OS type F) so that it would work more reliably. Then, being a fuel powered airplane, I had to decide how I wanted to power the electronics. It seemed to be that the consensus for the best battery type was the LiFe battery, as you didn't need to use a regulator to power your Rx and servos. So I got a 2000 mAh battery and it's been doing really well for me. At this point I was ready to fly! I had a bit more money in the airplane than I was hoping to spend, but my excitement was growing as I relished the idea of flying this big bird. I contacted someone from my club and they agreed to meet me out on the field and help me get everything flight-worthy and well, it flew! It was a bit slow, however, as the 17x6 isn't a good prop for the engine. But I was so stoked to have it in the air! It is very gentle at low speeds and goes where you point it, which is a quality I love in an airplane. After that flight I decided to order a 16x8 prop and new bearings, as you could hear the bearings in this old engine. Replacing the bearings took some ingenuity, as the prop nut backer (the silver bit on the crankshaft in the picture above) was very much stuck on, and I used a heat gun to help with the removal process. I followed a guide on the internet to figure out how to disassemble the engine and get the bearings out. It took about four hours. My biggest regret is not clearly marking the pushrods so that I could put them back exactly as they came out so I will be doing that in all future engine rebuilds. That brings us to the first video. This is kind of long but it goes through my process of starting and tweaking the bird. Not much action here but if you're curious give it a look-see! After getting it tuned I took it out again, this time with a 16x8 prop. It flew so well! But on the second flight the engine was randomly bogging. I still haven't discovered exactly why, but after talking with an experienced member of my club he asked me what kind of fuel I was using. I had 10% nitro, which is best for 2-stroke engines, so I got some 15% 4-stroke fuel. It runs better now, although there still seems to be a bit of bogging. It revs much higher which I'm very excited about! The airplane didn't come with a spinner, so I ordered a 3" spinner off Ebay. It arrived with the wrong size of crankshaft hole and an M4 bolt to mount it. I very carefully used my drill press to enlarge the hole in the backplate to the 10mm used by the Saito's prop shaft. This needs to be centered, so I took my time. I then needed to find a way to attach the spinner to the prop. The prop nut that came with the Saito used a #10 machine screw, which is larger than an M4 bolt. I decided to get the appropriate #10, grind down the head so that it would fit in the hole in the nose of the spinner, and increase the size of the hole for the spinner so the bolt shaft would fit. 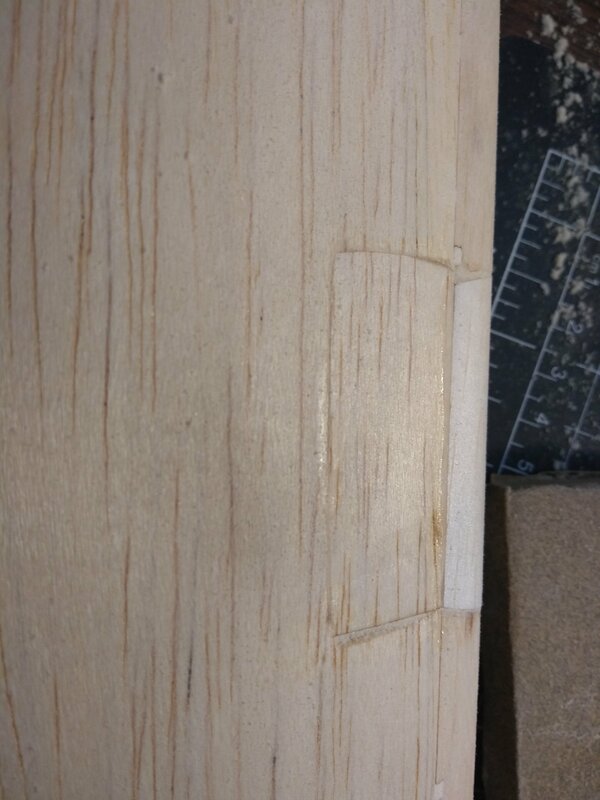 Again I used my drill press. For the bolt head I put the bolt in the drill chuck and used sandpaper to grind it down until it fit. The spinner really adds to the look of the airplane, and now I can use my starter on it! And that's how the airplane sits today! I'm hoping to fly it this coming weekend on my birthday. What a great way to celebrate a year in the hobby! So many great memories made, hopefully many more to come! Feel free to comment in this thread with any questions, comments, or banter you'd like. I'll try and keep it up to date with the life of this airplane! First off congratulations I find after flying balsa flying foam is not really the same, the balsa to me always flies better. Yes, I can relate to that. Something about the size and the noise makes it much more exciting than my foamies. However, I don't think I'll get away from building with DTFB any time soon, because those models are so good to just fly out of my backyard without too much of a care about how the landing is going to go . I got a chance to head out to the field this weekend and had a ton of fun! A friend brought a 15x10 Master Airscrew prop and the Saito 150 really likes the heavier, plastic propeller. It flew really well but I landed in the tall grass the first time, then started having issues with the engine cutting out in flight! It happened the first time and I brought it in just fine, however, I took it right back up and it happened again. On the second deadstick landing I hit the safety fence with the wing and ripped the wingtip off! Here's the damage. 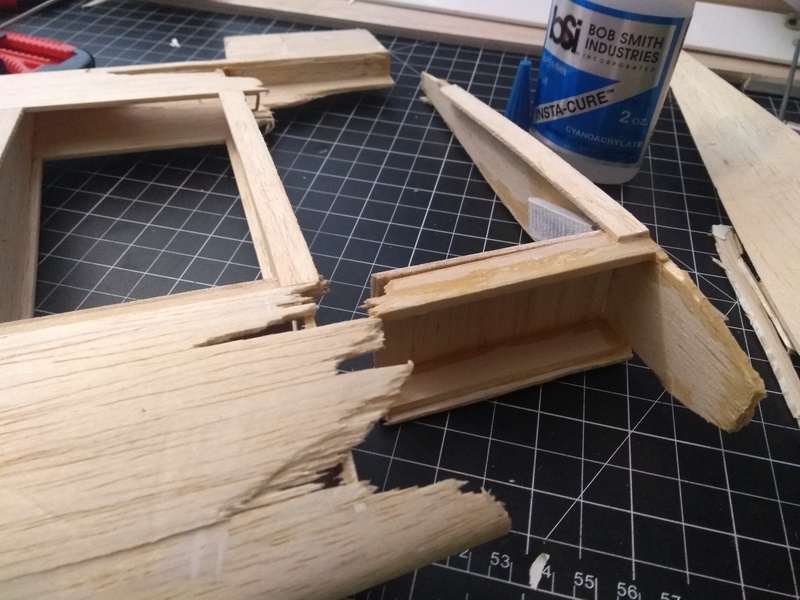 I got some more balsa sheeting and sticks and I have plans to repair it. 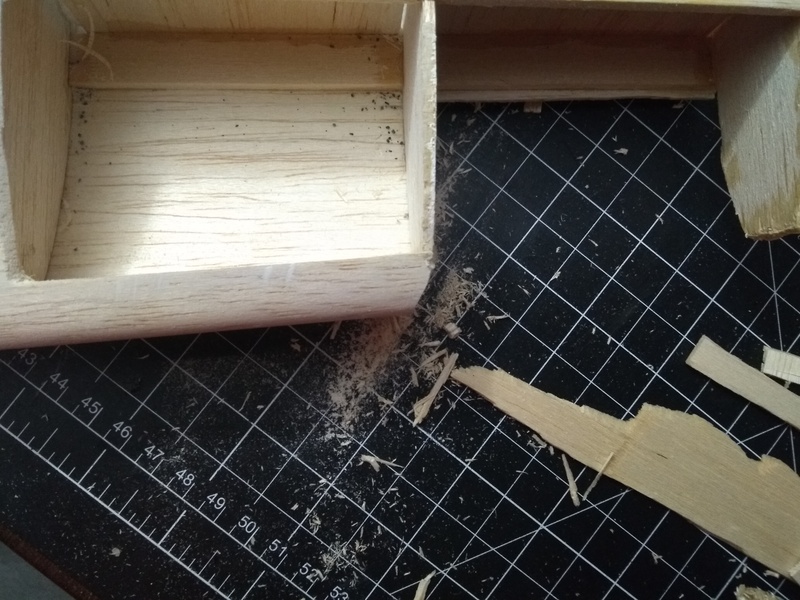 I picked up most of the pieces and the missing rib and wingtip block are alright. 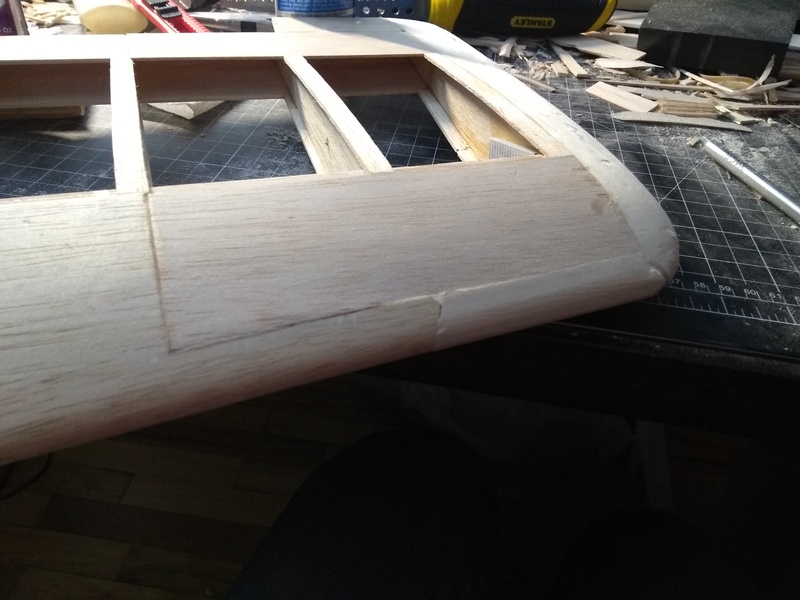 I'll probably recover the entire wing, as the covering that's on it has many holes, and I'd like to learn the art of covering. I took out the fuel tank and it turns out what was causing the engine to die was that when I had my first hard landing the clunk was thrown to the front of the tank, causing the pickup to not work when the airplane was pitched up. Oops! I'll have to keep that in mind! I'll also have to work on my rudder skills. Fuel planes are great. For me, anything that needs a battery bigger than a 4000 6 cell should fly fuel. Electric is great, but the big batteries scare me to death, and I hate how much they cost. For big planes, I think fuel is a safer and more economical route, as long as there’s a place to fly a plane that makes noise. Welcome to the fuel club!! My Flying career has gone the other way. I started on IC engines because electric ones and their batteries were too heavy to be practical at the time. I had a break from flying for about 13 years and recently started again.I had one electric plane in my previous life. Now, I'm all electric. Your story reminds me why. 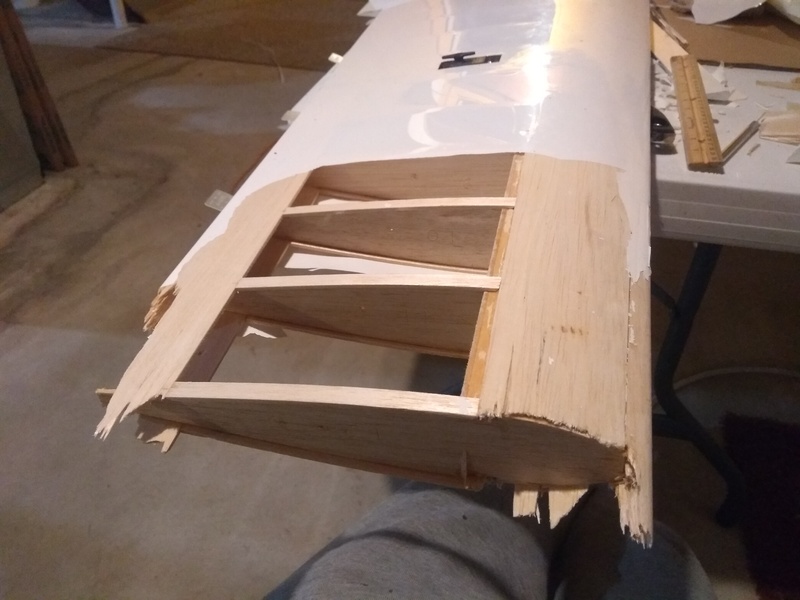 I think I lost my last 4 planes on their maiden flights after weeks of building, then the rigorous testing and setting up of the motors to get them running perfectly on the ground in every orientation, only to have them go dead in flight at the most inconvenient moment. I loved my IC motors in their day. They add something to the experience for guys like us that love to play with mechanical things, but if I step back and try to be pragmatic, they've had their day as far as I'm concerned. Maybe I'll switch back after my first lipo fire. Who knows! Any thing I put together now is strictly gasoline it runs so much better and fuel is so cheap. My Evolution 10CC runs 20 minutes on 10 ounces of gasoline. The last few years the gasoline motors have just gotten so much better, better carbs is the main thing. With the pumped carbs I can place the fuel tank any where I want in the airplane on the CG is the best as flight envelope does not change.. I'd say there are defiantly trade-offs, but I would agree that fuel is the way to go with larger airframes, just based on my limited experience. Yeah, the engine cutting out is not a pleasant thing. It may truly bite me someday but at my flying field most of the time I'm not far from the runway. I've found fuel to be a wonderful learning experience and I really enjoy the noise! Also, the power is fantastic. I see where you're coming from but while I don't like it when my airframe fails me, I think it's just part of the hobby that we have to deal with. I am looking forward to converting my airplanes to Gas once I get the chance. Nitro is just so expensive! Thinking about picking up a second-hand 20cc for this bird, but I have to save up first. Another plus on the smaller up to 20cc is that they are beam mounted so makes the conversion so easy usually drop in and redrill mounting holes versus using standoffs on the bigger engines. Just stumbled across this and love to see your journey with this. I subbed to your channel as well. Hoping to be there someday as well. I plan to go with gas instead of nitro/glow. 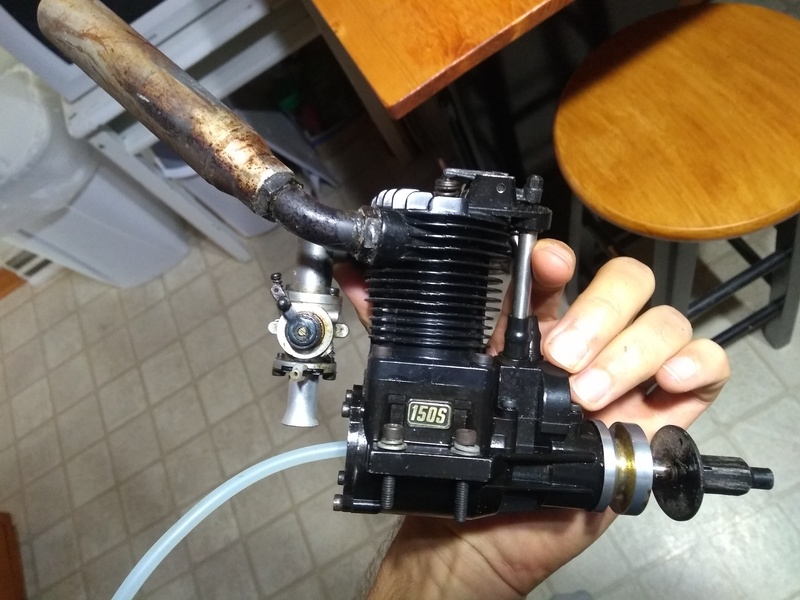 You know I just remembered a post in one of the groups on Facebook of a guy having issues with a Saito glow engine dying on him in a few flights (it was a Piper Cub about the size of yours...can't remember the model of the engine). Think someone came back and said that Saito's, once they are set up correctly, run great. 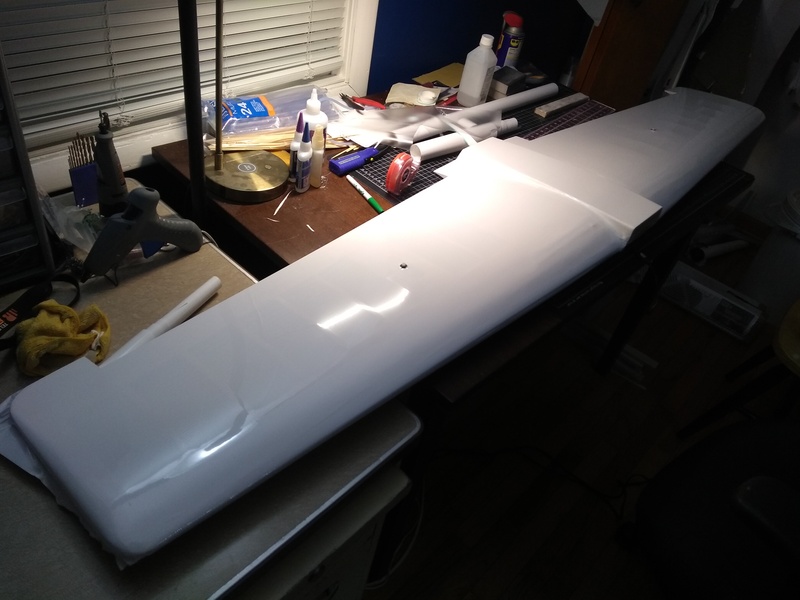 I am almost done fixing this bird, I put the wing back together, sanded, and covered the bottom with Hobbyking White. Looking forward to covering the top, as I'm enjoying the process! The hardest part was defiantly the bottom of the wing saddle. I've got to start watching this part of the forum a bit more... Nice work on the reconstruction! 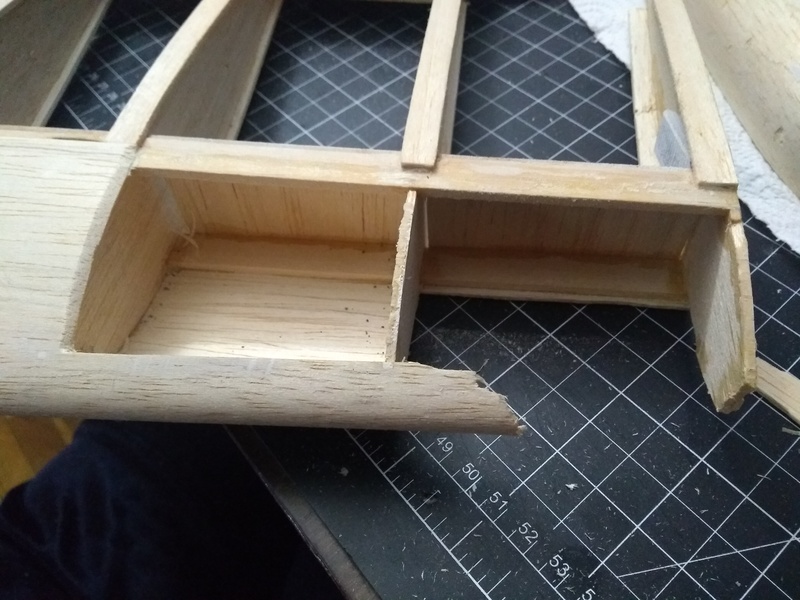 That's one of the big things I like about balsa builds, that they can be fixed to the point where it really hides the repairs fairly easily. Alright, the wing is completely re-covered and the Ultra Sport is flying again! I had some fun with it this weekend but when I I got it up in the air the second time I couldn't help feeling a little - dare I say it - bored? The airplane flies really well, almost too well. What can I do with this gentle-yet-fast flier to make flying it more of a challenge (besides compromising the flying characteristics )? From what I have seen the Ultra Sport is along the lines of a pattern ship,, precise flying lines, keeping everything smooth, loops rolls ,4 point rolls. knife edges. I like @Bricks idea - rather than try to modify the plane - use it to learn to fly really accurate patterns. Yeah, I didn't really want to modify the plane. Just looking for ideas on what to do with it other than bore holes in the sky. I don't know how maneuverable it is, but maybe some of these for inspiration. That's awesome. I wish it had more rudder authority.